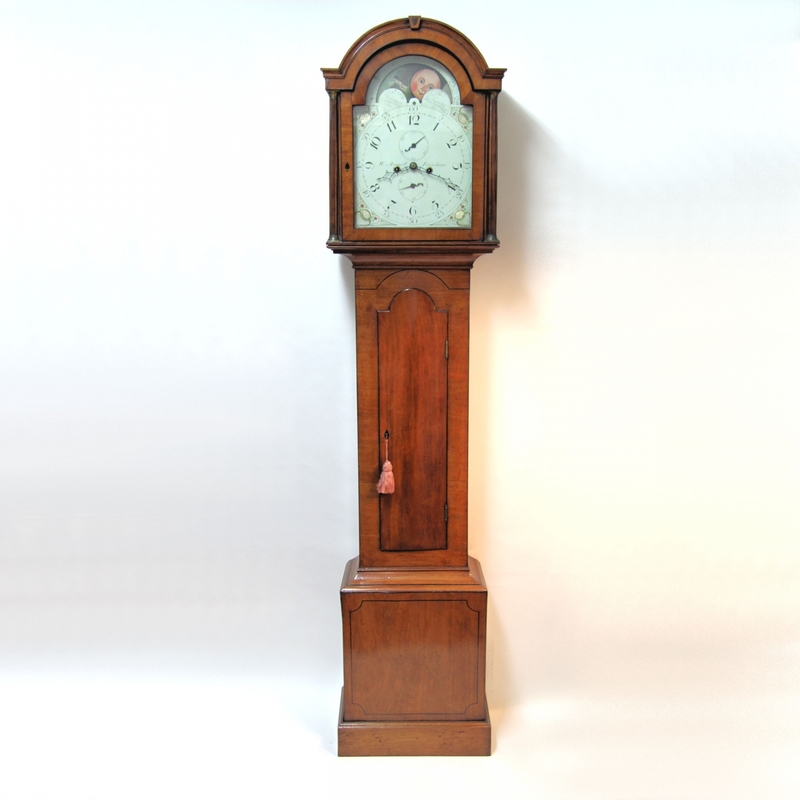 An exceptionally original Surrey clock by a popular and respected maker. 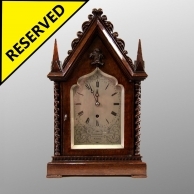 The eight day duration movement with decoratively shaped pallets to the Anchor Recoil escapement and rack striking the hours on a bell also, unusually shaped plates, the front of which has larger protruding sections to incorporate the dial feet and make a false-dial unnecessary. The under-dial striking parts are also decoratively shaped and well executed and the rack has a screwed, sprung tail to cut the risk of jamming on the snail step. 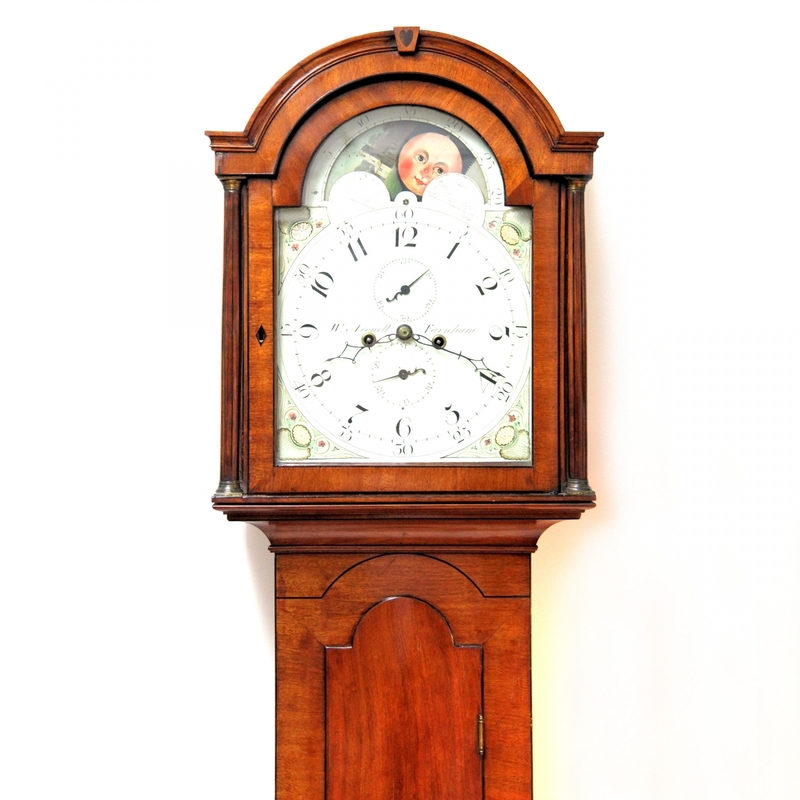 The well made and decorative features of this movement are absolutely typical of this well known clockmaking family that were prolific in Sussex and Hampshire for two hundred years. 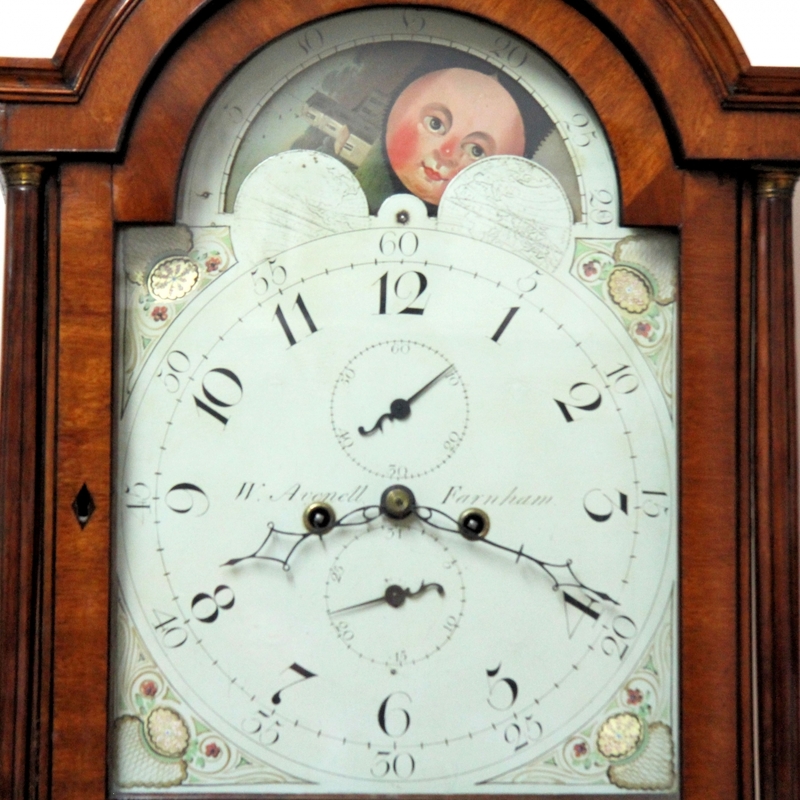 The 13" wide, break-arch painted iron dial has phases-of-the-moon in the arch, geometric floral patterns to the corners, maps of the world within the moon-phase area, subsidiary seconds and calendar dials to the centre area with the maker's name "W. Avenell (of) Farnham" across the centre. Also, a divided minute ring with bold Arabic hour numerals within and outer Arabic fives without. 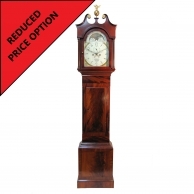 In a pale plain mahogany case of good proportions that has ebony stringing throughout including to the sides. 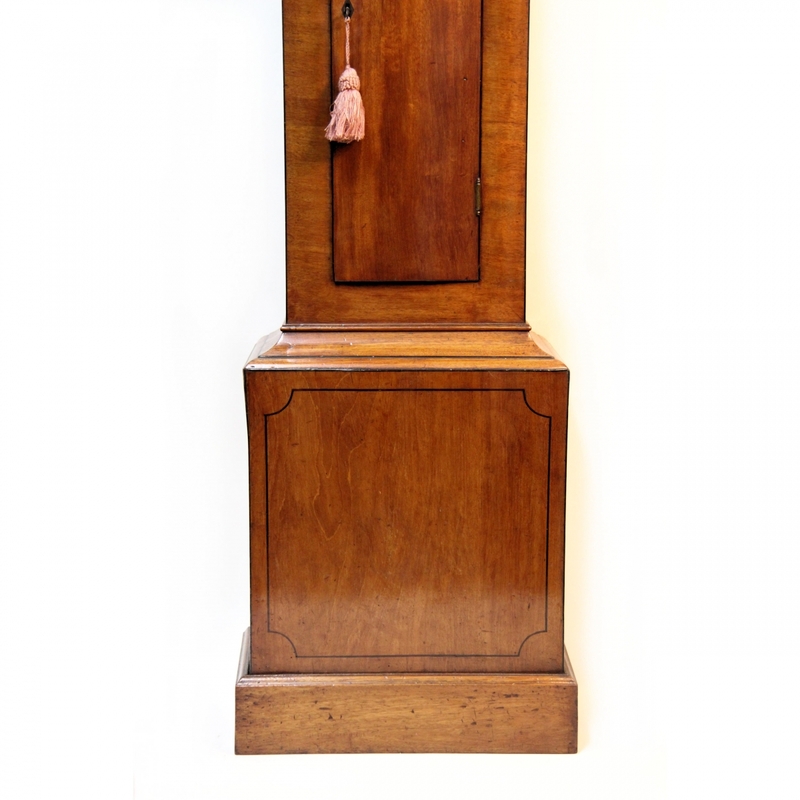 The break-arch hood has reeded pillars with brass capitals and the trunk has a full length break-arch door. 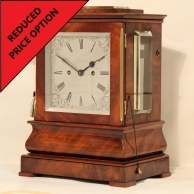 * It is worth noting that following Admiral Lord Nelson's death in 1805, the nation went into mourning and as a mark of respect, black lining was applied to a great many object including furniture and clocks. 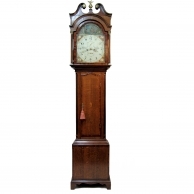 Dimensions: 84 3/4" high x 19 1/4" wide x 10 1/4" deep. 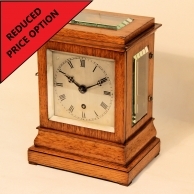 Condition: Excellent with good colour and patination to the dial and case.